What was the coolest business phone of 1994? Answer the Nokia 2110. It was the smallest GSM phone on the market. The Nokia 2110 was pitched at the high flying executive travelling to Europe and making the most of the GSM network. It was also the first mobile phone with the Nokia tune. At this stage Nokia had not adopted this ringtone as their signature tune, it was just one of five tones the user could choose from. The Nokia 2110 was Nokia's second generation of GSM phone and the first one designed purely for the digital network rather than a reworking of an existing analogue phone. 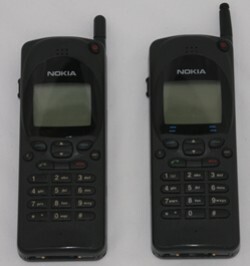 The 2110 and 2110i were Nokia's flagship business phones from 1994 to 1997. The simple, understated design made this phone an instant classic and the definitive business phone of the mid 90s. It won What Cellphone's Business Phone Award for two years. Nokia's adverts were bullish enough to call it 'Simply the best digital phone in the UK', quite a claim! To get one of these in 1994 you had to sign up for Vodafone's EuroDigital package, the one for high use business customers. A variant of this design, the 2140 became the first Orange phone. Although the Nokia 2110 never achieved the kudos of, for example, the Motorola 9800X or StarTAC, Nick Goodway of the Daily Mail called this phone the "probably the most significant mobile phone ever made". Even today this phone is a joy to use. It has that distinctive feel of understated quality, so easy to recognise, yet so difficult to engineer. A retrospective press release from Nokia recognised this phone as Nokia's first iconic product. During its lifetime the Nokia 2110/2110i sold twenty million units, not bad for a business phone. The Nokia 2110 is quite rare, whereas the Nokia 2110i is much more common. If you are looking for the phone that was the first to have the Nokia tune, not a later revision, you need to look very closely. The picture on the right shows the Nokia 2110 (left) and the 2110i (right). There are two visible differences. The most obvious is the smaller rounded aerial on the 2110. There are also four blue dashes under the screen of the 2110i. These are not present on the 2110. Another clue is the firmware number. The 2110's firmware number is NHE-1XN and the 2110i's is NHE-4NX. To check the firmware number, remove the battery and it is printed on the back of the phone. There is currently little difference in value between the two phones, but this is likely to change in the future.